[prMac.com] New York, New York - Magzter, the world's largest digital magazine newsstand, adds another exciting edition of Vogue magazine to its catalogue. Magzter, which has been already digitally publishing Vogue magazine from the US, India, Australia, Turkey, Germany, China, Russia, Mexico, Ukraine and Thailand, has now brought on board Vogue Arabia, which places fashion in the context of culture and the world we live in. Like other editions of Vogue, Vogue Arabia also immerses itself in fashion, always leading readers to what will happen next. Published by Nervora and featuring articles in both English and Arabic, Vogue Arabia is thought-provoking, relevant and influential in defining the culture of fashion in the Arab world. 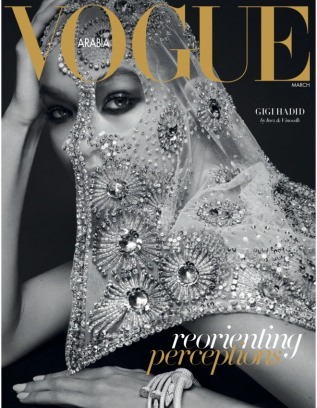 The inaugural edition of Vogue Arabia features Gigi Hadid as you've never seen her before and "It Girl" Amina Muaddi. Also, take a look at Acha Laghzaoui Benhima's remarkable life and explore the best of fashion and culture for the Middle East. "We share a great rapport with several editions of Vogue across the globe, and we are thrilled to launch the inaugural issue of Vogue Arabia on Magzter. We firmly believe that Vogue Arabia will carry the legacy of Vogue by publishing trendsetting fashion columns in every issue, which would impress millions of fashionistas on Magzter." - Girish Ramdas, CEO, Magzter Inc.
"Vogue has been one of the best-selling fashion magazines on Magzter, and we are now excited to welcome its Arabian edition to our catalogue. We are quite happy that the publisher has adopted the 'digital first' strategy and chosen Magzter to quickly reach millions of readers all over the world." - Vijay Radhakrishnan, President, Magzter Inc.
Magzter - Digital Magazine Newsstand 6.14 is free (with in-app purchases) and available worldwide through the App Store in the News category. Published 11 times a year, Vogue Arabia is priced at AED 312.16 ($84.99 USD) for an annual subscription on Magzter. The Magzter app is also available on the web, Google Play, Amazon App Store, Kindle Fire and is expanding to more platforms soon. Magzter's easy purchase and renewal systems ensure subscriptions are paid on time, eliminating the need for paper checks and postal mail issues. Users can buy their magazines on any of the above devices/platforms and seamlessly port their purchases to any other devices, a feature unique to Magzter. Magzter is the world's largest and fastest growing global digital magazine newsstand with over 30 million digital consumers, more than 9,000 magazines from over 3,500 publishers. Headquartered in New York, Magzter has its local offices in London, Barcelona, Amsterdam, Mexico City, Cape Town, Chennai, Singapore and Tokyo and will soon be expanding to other countries. Founded by global entrepreneurs, Girish Ramdas and Vijay Radhakrishnan in June 2011, Magzter enables magazine publishers around the world to create and deliver digital editions of their titles to global consumers. Powered by its proprietary OREY Click Publishing System(R), Magzter also enables their customers to publish interactive/audio-visual content in the magazine as it supports HTML5. Magzter launched Magzter GOLD subscription service to give digital readers unlimited access to thousands of magazines for a low monthly price. All Material and Software (C) Copyright 2017 Magzter Inc. All Rights Reserved. Apple, the Apple logo, iPhone, iPod and iPad are registered trademarks of Apple Inc. in the U.S. and/or other countries. Other trademarks and registered trademarks may be the property of their respective owners.